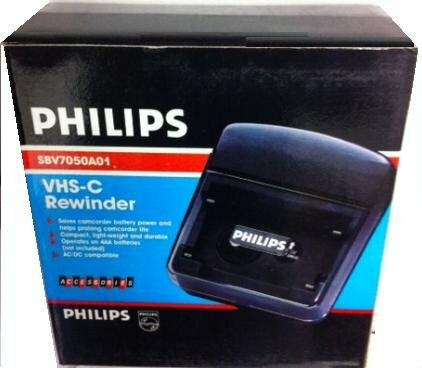 philips (FOR COMPACT CAMCORDERS ONLY) vhs-c (compact vhs tape) rewinder. Helps Prolong your Camcorder life. Rewinds tapes in two minutes. Auto Shut off. Rewinds cassettes in two minutes ac-dc compatible-for indoor and outdoor use. Convenient front see-thru pannel. Starts to rewind when cover is closed-springs open when fully rewound. Automatic power shut-off. will only work with vhs-c tapes. NOT FOR 8MM. convenient front see-thru panel. Starts to rewind when cover is closed. springs open when fully rewound.